Now that the Summer Solstice has come (and gone), and I can begin to assemble from my notes what actually happened to me when I performed the last three rites of this talismanic Portae Lucis ordeal. What I can say without any embellishments is that it was a smashing success, and that I experienced both an exalted sense of being as well as a down-to-earth centeredness. The Portae Lucis has now been inaugurated within my soul as an ongoing and evolving process, and I truly experienced far more than just a mere brush with the Supernal Triad of the Tree of Life. I have been told by Hermes Thoth that this process will continue to expand and evolve over time, reaching a very powerful crescendo at the Winter Solstice, but continuing on even beyond that date. I am looking forward to experiencing this evolving process, since at this time, I don’t at all feel either out-of-sorts or overwhelmed by what I have experienced and seen so far. In fact, I haven’t felt this solid and alive in quite some time. So the new rule is that magicians don’t need to follow the directions, and in fact, they can completely rewrite or rework an operation to fit their tastes and needs, producing something that is both new and successful. I think that I have pretty much proven this to be true, and perhaps now we can bury this supposed iron-clad rule with the rest of the unproven urban myths and misinformation about magick. If you choose to follow the old grimoires and work them exactly as they were written, then that is an esthetic choice that has nothing to do with success or failure. All esthetic choices are affectations that dress up (or down) any magical operation, and as long as they aren’t too cumbersome or impossible to employ, then they won’t interfere with the flow and occurrence of the magick, and the overall ritual objective. This is why I believe that magick is much more an art than a science. Anyway, I approached the coming weekend prior to the final three steps of this operation with diligence and a readiness to change or adapt whatever I was going to do, just in case some inspiration or insight caused me to do something else than what I had planned. I wasn’t locked into any specific schedule, other than the specific timing of the event. I knew that I had to complete everything by June 19 so that I could perform the final ritual working during the true midnight of what was to be the longest day of the year (June 20 - Summer Solstice). That date and time was set, of course, but the rest was to be more fully determined as the dates for those workings approached. I had fully resolved to perform a short-hand invocation of my mentor, Hermes Thoth Trimagistus, on Saturday evening, June 16. I then had sketched out some extensive Path Working trance and mediation sessions for either Sunday or Monday, or both days. I had taken the three days from June 18th through the 20th as vacation days from work so I wouldn’t have anything pressing to interfere with what I was planning to do. Of course, as it turned out, I had to attend business conference calls and do some other related work all through the three week days that I was supposed to be off. It would seem that I am engaged in a very important business project, and that I wasn’t able to get completely away from the responsibilities associated with my job. These required intrusions into the world of work were neither taxing nor distracting, so I was able to complete them without detracting from the magical work that I had been contemplating. 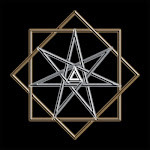 As the weekend progressed, I discovered some truly amazing connections between the Portae Lucis ordeal and the ordeals of Spiritual Archeomancy that I had undergone back in the mid 90's. I have written up a couple of biographical articles that you can read over if you aren’t familiar with what I did and how I did it back then. You can find these articles here, and here. Spiritual Archeomancy concerns itself with magically defining and entering into one of the eighteen Qabalistic Dimensions. These dimensions are the triangular shapes that make up the lattice of the Tree of Life, more easily seen if the Sephiroth and Paths are removed to show just the lines and vectors that make up the geometry produced by the Pathways. Enochian Qabalah would focus on this geometry, and it would stipulate additional hidden Sephiroth as well, since from the standpoint of that geometry, wherever two paths cross, there can be found a nexus point that defines a Sephirah. These triangles, taken from the shapes that the Pathways make as they cross each other, are the Qabalistic Dimensions, and they are supposedly the most exalted of the Inner Plane domains. You can imagine that gaining entry into one of the Dimensions would be a very powerful experience, and in fact, when I successfully entered the bottom two dimensions back in the 90's, it was a completely mind-blowing experience. However, once I had gained entry into those two domains, I never progressed beyond that point, and by the year 2000, I had more or less abandoned that series of ordeals even though I had only entered two out of a total of eighteen. More compelling to me was the fact that there are two Dimensions that are trapezoidal shaped instead of triangular, and I have long believed that these two domains are the most important and the keys to the whole array of dimensions. Both of these trapezoidal shaped dimensions lie above the 19th Path, so they are directly associated with the Greater Abyss, and unless I was willing to make that crossing, these dimensions would be, for the most part, out of my reach. So, like a fox staring at the luscious grapes hanging on the vine well out of reach, I abandoned this quest for other more pressing concerns. The reason why these previous workings that I performed over 15 years ago were on my mind is that I was editing my magical journals and writing them into my book entitled “Sepher ha-Nephilim." I had just completed the third volume in that series, so my mind was full of thoughts about what I did back then and what happened to me as a result of doing those workings. Little did I realize that the current ordeal was not only analogous to those previous ordeals, but that it represented a critical continuation of those ordeals. In fact, what I learned was that this ordeal of the Portae Lucis was the missing piece that I would have needed back then in order to progress further. Although I didn’t realize that until I started planning for the second working of the final three for this present ordeal. I found it all to be quite ironic when I realized it, since the Archeomantic ordeals had last been worked in the winter of 1998, when I was living in Santa Fe. The period of time that had elapsed since then was more than fourteen years ago, and only now had I discovered the next important piece! Such amazing continuity always makes me feel as if I were following a very distinct path through all of the years of my magical career, even though when I was living through it, I didn’t seem to either notice or realize this fact. This because the life of a magician can seem to be fairly chaotic or even sporadic (like any artist chasing the latest inspiration). What this means (and I apologize for the digression) is that the Portae Lucis, as I had changed and reworked it, now fit perfectly into the progression of lore that would be included as the system of magical Archeomancy. I hadn’t planned that in advance, but it would seem that this new ordeal is an important and strategic part of the overall magical lore of the Order. Anyway, allow me to continue presenting what actually happened during those three singular working events. I began the final days of the Portae Lucis ordeal with an invocation of Hermes Thoth. I had wanted to perform this working because I felt that he would be able to guide and assist me in successfully performing this ordeal. Coincidentally, I had originally performed this invocation back in 1997 to seek the aid of Hermes when I sought to enter the XVII Dimension. Even so, I wanted this invocation to be associated specifically with my Portae Lucis working. (I still hadn’t figured on the connection or synchronicity that was operating here.) The invocation proceeded without any issues and was a great success. That night, I used the shorthand ritual version to invoke Hermes Thoth because I already had previously invoked him and still had his sigil in my Liber Spiritum. I did manage to supercharge that invoking sigil with my Mercury talisman, and it made the operation even more powerful than what I had experienced previously. I placed that re-charged sigil before a large statue that I had of the Egyptian God Thoth, both of which were sitting on the central altar with my Mercury talisman. Needless to say, the results were nearly ecstatic for me. I felt exalted and fully empowered. I got lots of new ideas and insights imparted to me by Hermes Thoth, as well as some practical and personal advise. Here’s a few of the things that Hermes Thoth shared with me that weren't of a personal nature. Hermes Thoth also pointed out to me that where the pair of rites for Lilith had been completed, and the ones for Enoch had been omitted, he also declared that the 7th Degree Order workings would include the same pair of rituals for Hermes Thoth, making him the highest egregore of the Inner Order. I saw the logic of all of these comments, but knew that what was being proposed to me consisted of quite a lot of work, both in regards to designing and writing new rituals, and then at some point, performing them. It was sort of like being told that on top of everything else I was doing, I had to move a couple of mountains and build a city or two. I was wondering if Hermes Thoth had ever been a college professor, since that’s the kind of thing that a college professor would ask of his students. I started the working at around 10 pm and it ended just around midnight, but I couldn't get to sleep until 2 am the next morning. It was sort of like having a party in your head - all these impressions, insights and ideas just dancing around and raising hell. I wanted to sleep, but I just couldn’t get the party in my head to subside until a couple of hours after the working was completed. I was quite exhausted when I woke up on the next day (Sunday), so I decided that I would celebrate the beginning of the working with a feast. (I was going to start a partial fast on the following day, so this seemed like a good idea.) Because I was so tired, I knew that I wouldn’t have the energy to accomplish much of anything, anyway. While I had originally planned to do some path working sessions on the Portae Lucis Qabalistic transit for Sunday, being overly tired made me change that plan. I knew before starting this working that I had to flexible, but I had no idea just how flexible I had to be. Perhaps the most amazing information that Hermes Thoth imparted to me was that the Portae Lucis working was a continuation of the Archeomantic ordeal that I had performed in the 1990's. Instead of just performing a meditative and trance based methodology, I should instead opt to make it into a ritual magick regimen. I was therefore directed by Hermes Thoth to look over the rituals that I had used as part of the phase 2 of that previous working, and incorporate them into the Monday night working. The two rituals that he had pointed out were the Eneagram ritual, which is used to invoke one of the Ten Sephiroth of the Tree of Life, and the Double Tetrahedral Gate ritual, which is used to invoke the Pathways of the Tree of life. I should also consider using the ritual Qabalistic Pyramid of Power to set the Qabalistic World to Atziluth. 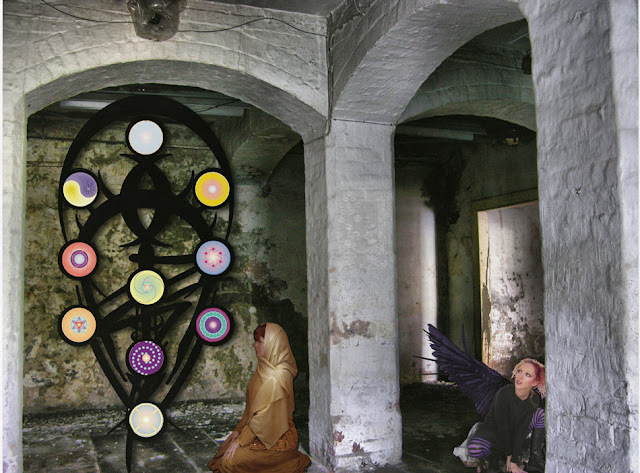 Since the Qabalistic transit for the Portae Lucis starts in Malkuth, and then proceeds to Yesod via the Path depicted as the Tarot card of the Universe XXI, and from Yesod to Tiphareth via the Path, Art XIV, and finally, from Tiphareth to Binah via the Path, the Lovers VI. I was going to do a series of Path Workings to capture this transit, but I decided instead to perform these rituals. I would also incorporate binding the four Sephiroth in this ritualized working to the four talismans. So with that injunction from Hermes Thoth, I would look into the feasibility of performing these rituals on Monday, and see what I could do to condense that overall process. I was aware of the fact that when I would perform the second phase of the Archeomantic working, that it typically took around three to four hours to complete. I wasn’t looking forward to spending that much in ritual on the night before the most important working in this ordeal. Sunday came and went quietly, since it had become a day of reflection, where I could follow up on all of the insights that Hermes Thoth had given me. Many pieces of my personal magical puzzle had come together over the last two days, and I could easily suspect with the looming Portae Lucis talismanic working, that a lot more could be expected to happen between now and then. Anyway, after this working, and even the following day, I felt really good about what I was planning to do. Even though I was tired on Sunday, I felt resolved, charged and completely at peace.